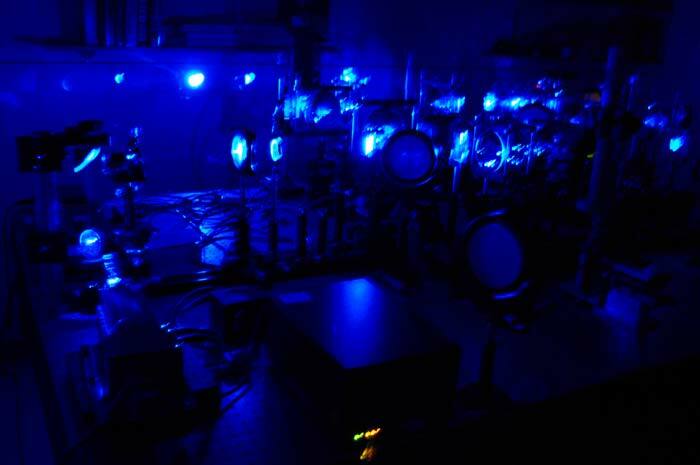 The complex CSLH (Confocal Scanning Laser Holography) microscope that I independently designed, built, and evaluated for my PhD research consisted of a Keplerian beam expander, wavefront splitter, dual scan mirrors, periscope pupil plane relay lenses, a Mach-Zehnder optical loop, back beam propagation through the beam steering mirror section, confocal optics, telecentric lenses, and projector optics to overlap the object beam onto the reference beam that forms a hologram on an image acquisition camera. 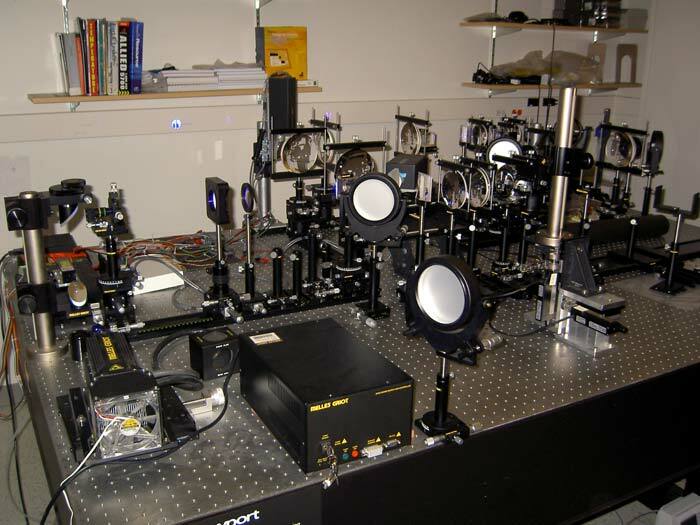 The CSLH microscope opto-mechanical components are configured on the optics table with over 60 components that required extensive alignment and calibration. Beam steering mirror rotation stages are used for the galvanometer scanning mirrors. Translation stages are used for the telecentric lens that supports the fluid-cell specimen, which is located at the back top right of the picture, and two-axis translation stage adjustment for the confocal pinhole apertures is seen attached to the vertical post near the center of the table and close the viewer. National Instruments hardware was used for both data and image acquisition and experiment control was programmed using LabVIEW instrumentation software. The CSLH microscope with overhead lights off and experiment in progress. The telecentric lens focuses and re-collimates two side-by-side propagating beams. The object beam passes through the specimen and the reference beam passes through a fixed specimen with the same refractive index to match the focal length and provide identical re-collimation. The periscope lens translates a pupil plane for minimizing beam walk during scanning. The spherical aberrations and off-axis coma causes the pupil plane to shift with field angle.